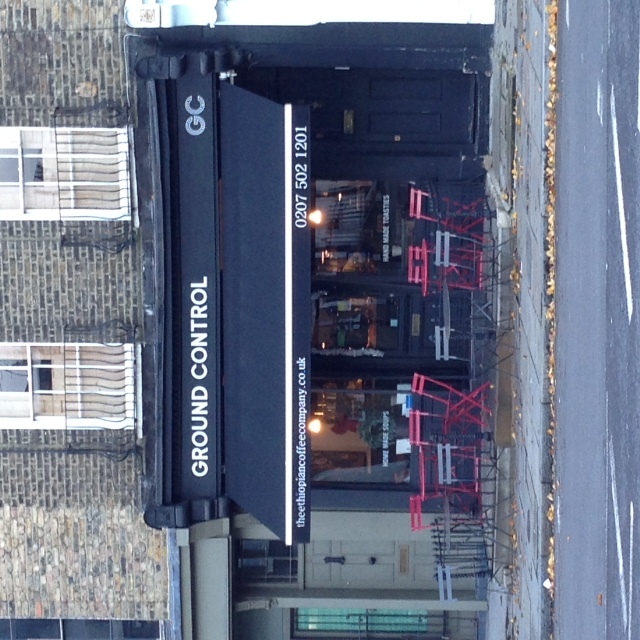 Ground Control is a small little cafe on Amwell St. If you are in the Angel/Clerkenwell area it is well worth stopping by this interesting cafe which serves a variety of Ethiopian coffees. Of course they offer the normal espresso, Americano etc. type drinks but if you want to sample their coffee properly, I think it best to try one of their coffees prepared with a V60. Tasting notes are shown on the menu on the wall. Being fairly small, there aren’t that many tables, however if you are lucky enough to get one of the two tables at the window, you will find plenty around you to look at without resorting to checking your phone while you enjoy your coffee. Behind one of the tables at the window is a set of shelves with coffee beans (presumably for sale). Behind the other table is a picture of a lady holding a jug and a basket. Vibrantly coloured circular patterns form the backdrop behind her. The picture (shown on the left) has a flow to it, you are almost drawn into the movement of the picture. 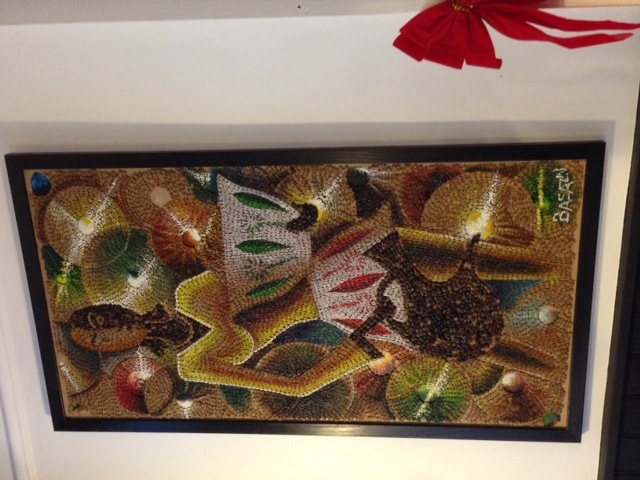 This movement comes from the many, differently coloured, coffee beans that have been used to make the picture. Each bean is orientated slightly differently so that the lines through the bean flow with the picture, rather than the beans being mere individual pieces of a mosaic. The circular patterns, the lines of her shirt, all of these are produced by orientating coffee beans this way or that. The mosaic is also richly colourful. Many of the colours stand out, but some, arranged next to each other, appear more subdued. How do we see the colours of a picture? How much of our colour perception is due to the pigment of the paint, how much due to the lighting, and how much is due to the individual colouration of the neighbouring beans? An artist known for his unusual use of colour was Georges Seurat (1859-1891). 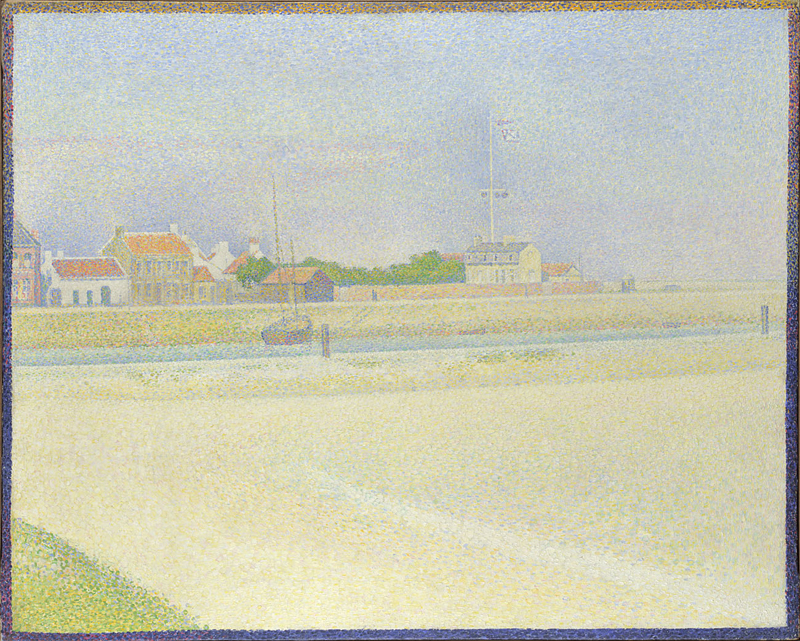 Seurat developed the technique of pointillism in which small dots of varying colours are painted next to each other. Viewed from a distance, the colour seen by the viewer may be quite different from the multitude of differently coloured dots perceived close up. As with the coffee bean mosaic, direction was given to Seurat’s work through the orientation of the painted dots. Seurat had based his technique on the state-of-the-art science of the day. One of the scientists whose work on colour theory influenced Seurat’s artistic development was Ogden N. Rood, a physicist who’s 1879 book “Modern Chromatics” he seems to have read (in its French translation)*. Rood had carefully distinguished between two types of colour mixing, that of mixing coloured lights and that of mixing pigments. Mixing pigments had been used by all of the old masters. It is the process by which paints are mixed to produce a new paint colour. Rood however showed that if small dots of colour were painted adjacently, when the painting is viewed from a distance such that the eye cannot distinguish the two dots individually but rather mixes them in the eye, the colour produced is that of mixing coloured lights, not coloured pigments. As he explained, colour mixing through adding light of different colours was an additive process, colour mixing through combining pigments was subtractive. More about colour theory and colour mixing can be found here. In the late 1880s, Seurat was criticised for relying “unduly on scientific formulae”, though he himself seems to have viewed his use of science merely as a guide, a way to help control the colour and light seen by the viewer*. The colours that we perceive can be affected by the colours they are adjacent to, as evidenced by many optical illusions. Yet even when everybody is looking at the same photo, we do not necessarily all see the same colour (I saw it as white and gold). There is indeed a lot to the science of colour perception and some great fun that can be had with it. Seurat was aware of some of this and used science to understand how to best paint his paintings. Note how the (pointillist) border of the Seurat painting pictured on the right is a different colour at the top, do you think that affects how your eye perceives the top compared to the bottom of this painting? Starting tomorrow, light and colour are to be combined in a three day “Lumiere festival” across London. The event looks as if it will take full advantage of the effects of different methods of colour mixing. If you are outside London, sorry! If you are lucky enough to be in London over the weekend, more details of what looks to be a fascinating science/art/experience event can be found here. Interesting info. Thanks Bean Thinking.